Quality Chess Blog » Beware – Tiger! Home > Authors in Action	> Beware – Tiger! Does the board not come out right in your end? But what happended with the Swiss-system blog… ? Ok, with FIDE inventing new rules every year I fear 1.Kh6 might be illegal these days. maybe Freedom of speech and BigBrother …. anyway jacob vs rest of the world isnt a very interresting debate. but how to improve on the swiss system is a good post. It has implication on weekend tournament as on the olympiads. I too was at the Dundee Congress over the weekend and I have thoroughly enjoyed the Swiss system debate, including Andrew’s spirited and good-natured riposte, before the blog was pulled…..
My theory, Jacob, is that after recently drawing with a few 2200 players at the Xtracon Open (formerly Politiken Cup), you decided to take great risks in all your games with the significantly lower-rated players. I think there is no doubt that Andrew is a stronger player than I these days. Those draws were sometimes very much appreciated. This is an entirely different thing than which tournament system is fair. But hurling insults gets lame quite quickly :-), which is not what I was looking for. My view is simple: use the same system for standings, pairing and prizes. The current one penalises those who are good at chess and have higher ratings. I cannot see the point of that. @An Ordinary Chessplayer: There really was not much left to say after your sagacious post on the subject mater. It’s a shame the thread could not just be locked rather than toss it down the memory hole. Jacob deleting the thread was a much better move but you’re still not letting it go. You can’t move on from this week’s meltdown to a new topic if you keep bringing it up yourself and picking off the scab. You are a great chess trainer but at the risk of being insulted diplomacy isn’t your strong suit so maybe stick to commenting on non contraversial chess topics and let John and Andrew deal with those topics on the blog . I mostly do not care what people think about me. Because as we saw in that debate, there are a lot of people who feel they are entitled to lecture others to great length, building a shaky moral platform of insults and lack of objective arguments. I think that the Swiss system used in a way where the tiebreak and the pairing are not following the same system is unfair. In the past I reacted to this by stopping playing tournaments where I am the number one seed. I deleted the post because it was distracting from work, not because I regretted telling people that feel the right to judge me without addressing the argument made what I thought of that approach. I saw this game while perusing the Batumi games and covered it on my YouTube channel. Reminded me a bit of Short-Timman from Tilburg way back when. I called the video something like “Tiger Mauls Opponent in ‘Short’ Fashion”, and couldn’t have been more pleased at my totally lame pun. 😀 Very cool game by a seemingly very cool dude! Couldn’t find your email, but in “Grandmaster Preparation – Calculation” exercise 20 is not a draw, it is completely winning for black. 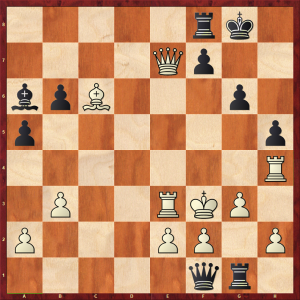 After Rh8 Qe1 d2 (or Rc7, but not Rbb8?) Qq1 Rc7 its lights out for white. But Qg1 is a mistake. White is much better after Qd1 (with the idea Qxd2) instead. But thank you anyway; we always look for improvements to the books! I should probably add that after letting the computer run for half an hour and checking what it came up with, Black seems to hold with a tempo. Practical Chess Beauty – printing If you don’t buy Sam’s book, you may suffer the consequences!